Greetings again from the darkness. You have probably not met anyone like Sophia. I certainly haven’t. 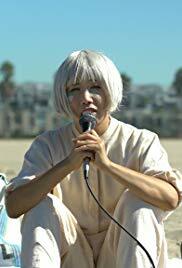 She’s a Korean-American performance artist who uses various personalities/characters in her “act”. She also lives alone in Los Angeles, and bikes everywhere … collapsing after a full day that consists of some mixture of delivering public diatribes, crafting her latest bizarre YouTube video, fulfilling her current TaskRabbit assignment, or trying to connect with a fellow human being – one that’s not someone else’s toddler requesting a horseback ride. Sophia is played by Vivian Bang, who also co-wrote the script with director Daryl Wein (co-writer with his now-wife Zoe Lister-Jones of LOLA VERSUS). Ms. Bang is herself a performance artist, so we can assume much of this is cultivated from her daily life. As Sophia explains to her mother in one scene, “It’s not art that people can buy.” We first see Sophia screaming silently into the portable P.A. system she totes around while sporting a snow white wig and white jump suit. She is standing in the middle of a grocery store and then proceeds to tell “her” story about immigrating to this country (it’s a story, but not really hers). The shoppers mostly ignore her. You might question why she is screaming silently or why she picks a grocery store (or public park) as a venue. The answers unfold slowly. Sophia has multiple interactions with Victoria (Nana Ghana), an African-American photographer of roughly her same age. The two women hit it off, with Sophia being very attracted to Victoria. As their friendship builds, and “signs” possibly misconstrued, Sophia admits to learning English by watching John Hughes movies – explaining her Valley Girl accent and overuse of “like” (a disservice to Molly Ringwald). The chemistry between the two actresses is terrific and we actually would have enjoyed a bit more, especially after yet another bombshell rocks Sophia’s world. An awkward movie audition, the use of cheese puffs and powdered sugar for YouTube videos, and a misplaced confrontation with a former lover/partner all lead us to better understand Sophia (and Ms. Bang) seeking validation of her work. On a couple of occasions she says “Can you hear me?” We might be trying, and Ms. Bang might have something of value to offer, though this film merely offers a tease. We sense there are similarities to the very talented Miranda July, only with differing missions. The excellent soundtrack is an added plus, and we will just have to sit quietly (without screaming) to see where this takes Vivian Bang. This entry was posted on Saturday, September 22nd, 2018 at 10:34 am and is filed under Comedy, Drama. You can follow any responses to this entry through the RSS 2.0 feed. You can leave a response, or trackback from your own site.